If there is one thing I've learned from many, many years of watching Doctor Who, it is that you can often get into places where strictly speaking you shouldn't be, just by boldly striding in as if you know exactly where you are going, whilst wearing an unfashionable jacket and a pre-occupied look. Which is how I found myself on Wednesday in a Q&A session at the BBC about the multi-platform nature of the Doctor Who brand. 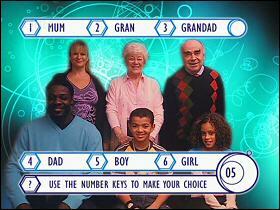 This was part of a 'Multi-platform' day being hosted by the BBC TeleVision department. 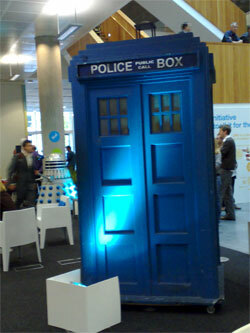 And of course, the obligatory TARDIS prop and Dalek were there too. The session was hosted by Peter Salmon and featured BBC Wales Head of Drama Julie Gardner. They were discussing how the whole multi-programme, multi-platform extravaganza came about. At first, Julie said, it was all a bit miserable and about saying no to people and being "the policeman". She cited shutting down the Cult website's animated webcasts. 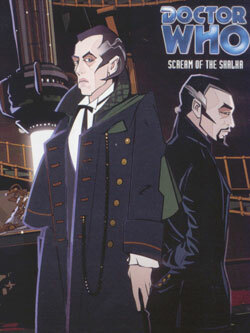 At the time they were enjoying success with the Richard E. Grant fronted "Scream of the Shalka", but this presented a mixed message to the audience when they were in the process of casting the 9th on-screen Doctor. So it had to go - at least temporarily. Julie Gardner was also quite clear that there was a definite distinction between 'fans' and audience. The internal line for Doctor Who has been 'Adventures in time and space, adventures with a friend', and that has been the guiding principle of deciding what is OK for Doctor Who and the current off-shoots. Julie felt that fans in chat-rooms could appear to be 'louder' than they actually are, and stressed that her job was to enable RTD to write what he wants to write, not write what fans and drama execs like herself want him to write. The ghost of RTD loomed large in the session, whether it was Peter Salmon's introductory suggestion that Davies must himself be a Time Lord, or Julie Gardner's explanation that at the start of the project RTD gave her 'homework' to watch key episodes from what is now deemed the classic series. The session started with a show-reel of the multimedia elements of Doctor Who, Torchwood and the Sarah Jane Adventures. 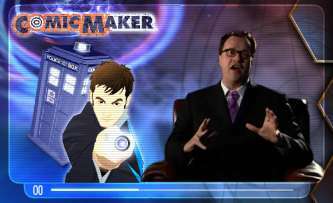 Included in it was Russell T. Davies' introduction to the Doctor Who Comic Maker. Julie had dearly wished that they had been able to do an animated cartoon RTD to introduce it - but he wasn't having it. The Comic Maker is something that I think is an interesting example of using new media to connect more deeply with an audience, but also at the same time using the internet to manage the volume of that deep contact. Julie described as a 'nightmare' the amount of mail that the Doctor Who office is besieged with. There is something about the 'brand' she says, that makes people want to tell stories. The online Comic Maker allows people, instead of writing in to the production office and saying "Wouldn't it be great if you had an episode where Rose met Martha and the Slitheen pretended to be the 9th Doctor and then the Daleks blew up the moon to destroy a Cyberman base on it", to make the story happen online. So far there are something like 30,000 unique Doctor Who comic strips published there. Peter Salmon cited Doctor Who as the BBC's biggest single multi-platform success, and asked Julie to explain how it had come about. She admitted that it had been a bit of an accident, but that the genuine enthusiasm from people within the BBC and the wider media for the revival of the show had made the job easier. Her view echoes my feelings about the programme, that this revival has been fuelled by the fact that the age range of media commissioners and media commentators pretty much ensure they all remember watching Jon Pertwee and Tom Baker in the seventies, and championed the show's return out of a nostalgic warmth. It seems to me that even if the new format falters after 'the gap year', and the expected departures of both RTD and David Tennant, then it is almost certain to get revived again in 15 to 20 years, when the media is being run by the generation of children currently watching Doctor Who on TV and interacting with the brand via the web and their phones. "The TV show has to be number one, because if that doesn't work, nothing does." She also revealed some tension between the TV and the multi-platform production. At one point RTD had needed to be firm about scheduling because he felt the production of the mobile phone TARDISodes was taking precedence over the production of the full-length programme. Julie also spoke of frustration that the online team had used their budget to hire a steadycam, and had much better shots of the Torchwood set than the television production team had ever achieved on their budget. She explained that they had even tried to filch them for the show, but incompatible formats meant the shots couldn't be used. The aim of the session was to help explain to BBC staff and to independent production companies how to get multi-platform concepts commissioned by the BBC. Julie revealed that getting Doctor Who stuff approved had been easy, because of the goodwill to the brand, but that it had been much harder to get the buy-in for extensions to Torchwood, since it was an unknown quantity. In fact, she talked about an idea that ended up unused in Torchwood, for "The Ruby Files". This was a plan to have a minor recurring character in the show and flesh out their online life, before they returned at a later point in the series. Having followed the online narrative would have in turn enriched the television experience for the audience. Some old media habits die hard however. Julie found herself referring to the "ratings for people hitting the website", and she had been briefed with a glossary of new media terms in case she got asked technical questions. At one point someone asked something about whether the tail was wagging the dog. Quick as a flash Julie exclaimed, "Oh, I've got something about tails here". She was obviously excited to be able to make use of the glossary, and so explained the concept of 'The Long Tail'. "The long tail. You heard it hear first" said Peter Salmon. 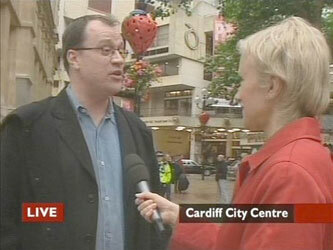 Julie was very enthusiastic about the fact that the new media team had been with them in Cardiff during production. She stressed how important it was for them to get to grips with the tone of the show and the development of the characters. However she couldn't help but give away the natural priorities of the programme maker. She said that it had been great for the new media people to sit with the actual production team. Credit where credit is due however. Peter asked her if sometimes she didn't just wish that instead of this multi-media empire she just had a really succesful 7pm Saturday TV show. She said she didn't think you could just do that anymore. One thing that interested me as well was that nobody mentioned the BBC7 audio stories featuring Paul McGann as the 8th Doctor. These have been produced for the BBC by Big Finish, but clearly fit into the ghetto of 'the classic series' rather than the brave new world of the BBC Wales productions. "Who is going to be the 3rd Time Lord [sic] after David Tennant goes to Hollywood at some point in the next 4 or 5 years"
One great question came from one of the BBC's archivists, asking how interactive and multimedia content like the Attack Of The Graske was being preserved, or indeed, if it was. "Oh. I have a terrible feeling I know absolutely nothing about this and that we aren't doing anything." "Are we? Oh, we are? Oh great. It's all fine." Another question was about the tension between the commercial potential of the Doctor Who brand, and the 'free' stuff. Julie Gardner used the example of the recent concept art gallery put up online. She explained that there had been a strong feeling that this would be highly desirable exclusive material in a future coffee-table book about the design of Doctor Who Series 3. The solution was to put some stuff on the web for free, and to hold some things back for eventual commercial publication at some point. The session finished with Peter Salmon asking a controversial question about who she preferred as the Doctor, and one about the recurring theme throughout the session of Julie having the glossary that included the term 'widget'. She revealed that she loved all Doctors equally, and that she preferred her widgets to be related to beer cans. By Martin Belam on 28 September 2007. 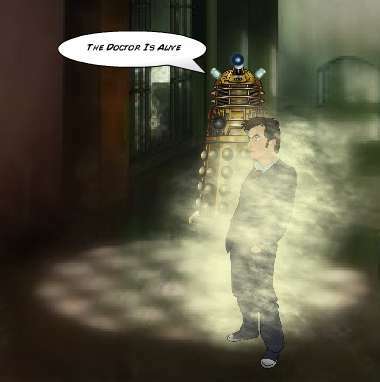 The only thing with that Doctor Who comic strip maker... I am a really creative person and am always writing Doctor Who stories, and would LOVE a go at the Comic maker. But because I live in Australia and not the UK, it bloody doesn't let me have a go. Stupid. There ARE huge fans outside the UK as well, don't they realise?